President/Founder of ReedGeek, Inc.Since the company’s inception, Mauro Di Gioia and his ReedGeek products have been credited with bringing about a resurgence in reed maintenance and adjustment. ReedGeek tools have quickly grown in popularity and are now used by the world’s foremost woodwind players, both single and double. Mauro Di Gioia is an entrepreneur, free-lance saxophonist/woodwind player, and the founder and President of ReedGeek, Inc. (which manufactures ReedGeek Products) based in Carson City, Nevada. 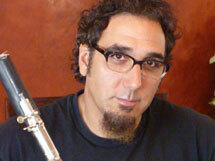 For many years Mauro has dedicated his time to the betterment of reeds and reed performance for all woodwind players: publishing several articles on reed acoustics and adjustment in leading industry magazines and guest lecturing for master classes at various colleges in the United States and abroad. Most recently finishing two tours in China. Mauro has also worked with and designed reed cuts for some of the greatest players in the world, including David Sanborn. "Players should not have to be at the mercy of their reeds. Everything comes down to maximizing the reed’s function through profiling, flattening and maintenance. With knowledge, a little practice and dedication, a player of any level will see positive and noticeable results in his/her reed performance."